Control of the oceans is key. The country that controls the waters controls the planet. That is the central premise that gets repeated again and again. The world population will grow and then hold steady for some time and then start declining as people age. The 21st century clearly belongs the US. No China or any other nation will upstage it – at least for the majority of the 21st century. Like humans, civilizations go through phases – a contradictory mix of juvenile brashness and fear – the US is described as a moody, teenaged adolescent; an accommodative maturity and a confused decline. 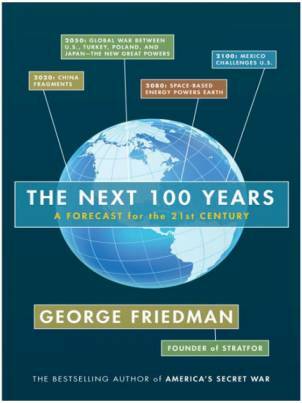 USA is in the first stage of its life-cycle according to Friedman. The thing going for USA is its low population density and relative isolation from the world’s political hotspots. The preference for US is not to annihilate its enemies but to incapacitate them. Never allow any politically sensitive region to stabilize. US taxpayers will effectively fund this destabilization, thousands of miles away from their homes, via US aid money. There will be massive shortage of labour in the US. The country will ease its immigration policy and countries will compete against each other to attract skilled immigrants. President Obama is raising public awareness and debate in the US even as I type. Japan continues to grow and locks horns with the US over the control of the Pacific – at least the part which touches E. Asia. Turkey rediscovers its past glory and the modern version of the Ottoman Empire will rise and become a major superpower. The world’s reliance of oil will fade since it will become commercially and technologically feasible to capture solar energy in geo-synchronous orbits and microwave it down to the Earth. Japan will collude with Turkey and they have a World War III with the US. (Now it becomes a bit of a stretch really) Wars will be fought from guns placed in a geosynchronous orbit in space. Japan will use Turkey as a decoy and divert US’ attention there. Will fire projectiles from the “dark side of the moon” to US space bases along a path that’s non-collisional. US military observers will assume these are harmless meteors and space junk and ignore them till the point booster rockets and charges fire up on these Japanese projectiles to alter their course. End game: US will still win the war. It is here that India gets a brief mention as an US ally and the attacks that its western part will sustain from Turkish missiles! The soft immigration policy of the US I mentioned in point 7 above will reverse due to the waves of influx of the Mexicans. The Mexicans will take over their erstwhile territories that were annexed by the US. The US only knows to fight wars on foreign soil, it will have no solution to the threat that will rise from within. US Hispanic citizens will openly flaunt their Mexican citizenship and any sustained action on American soil will kill non-Mexicans too. The challenge from Mexico to US supremacy will be most perplexing and one for which the US will not have an answer for. This beautifully designed interactive chart shows how the center of density of US population is gradually moving in a south-westerly direction from the north-east. Towards Mexico. Listing flashes of recollection from what you read is hardly a review and most certainly not a proxy for actually reading the book. Do read it, I am sure I have missed many points and certainly the tone and context that Friedman puts between the covers. This book will surely make you think. The internet and its impact on geopolitics is not mentioned. Lesson for Indian investors (who have a 3 – 5 year investing horizon): study the US. Understanding cross border flows of capital and patterns thereof can make money for you. At least for the next 100 years.